The County Board of Supervisors Monday voted to waive permit fees for the rebuilding of more than 200 structures that have been destroyed or damaged in the Lilac Fire. The board also extended an emergency declaration in relation to the fire. The waiver of plan review and permit fees could save residents and businesses thousands of dollars as they begin the task of rebuilding. For example, the county typically charges at least $4,200 for the review and permitting of a 2,000-square-feet house, according to a fee table. The waivers apply to structures within the fire’s perimeter in unincorporated areas and any other areas in which county approval is needed. “Our deepest sympathies go out to the residents of our county who have lost everything this holiday season,” Director of Emergency Services Holly Crawford said. The blaze began at around 11:15 a.m. on Thursday, just west of Interstate 15 and north of Lilac Road in Pala Mesa, amid gusty, arid winds. The fire has held at 4,100 acres since Thursday night. It is 80 percent contained as of Monday morning, according to Cal Fire. 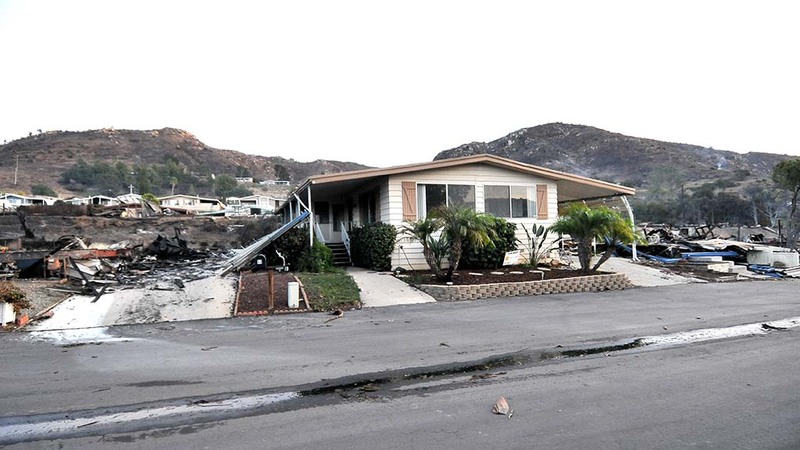 Thousands of North County residents were forced to evacuate after the fire broke out. All evacuation orders were lifted by Sunday night. The county counts 104 residential structures destroyed and 13 damaged, two commercial structures destroyed and five damaged, 78 accessory structures (such as barns) destroyed and 10 damaged, according to Amy Harbert, the county’s disaster recovery manager. Several resources are available to people navigating the recovery and rebuilding process. Residents can visit a local assistance center that has been set up at the Vista branch of the county library at 700 Eucalyptus Ave. It is open from 9 a.m. to 6 p.m. beginning Monday. Residents may also visit www.sdcountyrecovery.com or call (858) 495-5200.